ROSCOMMON, Mich. -- Discovering Forest Dunes Golf Club, in the dead center of Michigan's lower-peninsula "mitten," is like stumbling across Shangri-la or the lost city of Atlantis. The setting for the private course-to-be is a major surprise that leaves one dreaming of it after visiting. 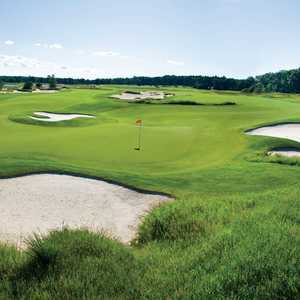 While Michigan's northernmost resort courses in Gaylord and Traverse City are visited by plenty of tourists and vaunted through area-wide marketing grouping them as a "Golf Mecca," Forest Dunes stands alone -- very alone -- to the south, three-hours' drive north of Detroit compared to the four-to-five hours needed to reach golf belt that wraps the northern part of the state. Forest Dunes hides on a road less traveled -- a short drive east of Grayling, a fishing and canoeing town best-known as an exit on Interstate 75 on the way to Boyne, Treetops or The Bear. Leaving the expressway behind, the population gets thinner, the trees thicker, and the air fresher. Halfway to Lake Huron, you're in 1,200 acres of heavily wooded land surrounded by eight-square miles of protected state and national forestland. You're at Forest Dunes. Can you hear the quiet? The awesome stillness of the remote location makes an immediate impression -- the course is even a mile-in after you pass the entrance gate. The only sounds you are likely to hear are gasps and giggles, because while the 7,104-yard course is breathtaking, it is also great fun. And available for public play only until the membership roster is filled and the proposed residences built and occupied -- if and when. While the location is nearer Detroit and presumably, according to the developers, more easily reachable, there is some question as to whether such a remote location is saleable. Thankfully, any homes built will not be on the golf course, but rather, on sites surrounding the placid little Lake AuSable to the south of the first tee, where a clubhouse and small village are proposed. It was 1973 British Open champion Tom Weiskopf's delicate hand that tenderly took this terrain and laid a fast track through it. "I would put Forest Dunes in the top-three courses in which I have ever been involved," said Weiskopf from his Arizona office. "It's stunning beauty contrasted with natural sand dunes, beautiful deciduous hardwoods and pines, along with perfect contours and changes in direction allows me to make this statement." The outspoken Weiskopf has never been shy about making bold statements, but Forest Dunes developer Tom Fous chose his words carefully. "If I told you Forest Dunes was the Pine Valley of the Midwest, I know it'd be like telling you I'm married to Cindy Crawford," said Fous. To provide inspiring examples of comparable golf, Fous took his building crew on trips to Sand Hills, Crystal Downs, and Pine Valley-knock-off Pine Barrens at World Woods. The result is a traditional-style course with thoughtful shaping, sand scrapes and rugged, scrubby areas. The natural sand dunes blend through native grasses and teeming with flora, century-old red pines and jack pines. The plenty-wide fairways -- Weiskopf insists they always be at least 35 yards wide, dance down to greens with open entrances for bounding approach shots and running pitches. The tree clearing was also adequate so that the woods provide an isolated but not smothered feeling. Sandstone colored cart paths add to the natural feel. The front nine is sporty and serene. The inward half is revved-up and rowdy. It begins with a 401-yard, dual fairway divided by mounding and sand. The hole is named "Decision." The 192-yard 11th hole features a 10,000-square-foot crescent-shaped green. Depending on the hole location, "Prairie" can play decidedly different every time, but the green is always fun. The dramatic finishing holes begin with the 231-yard par-3 16th, 200 yards worth of carry over a rugged dune area known as "Hell's Acre." The hole is wide enough, still, for a shots misdirected right or left, but don't push your luck. 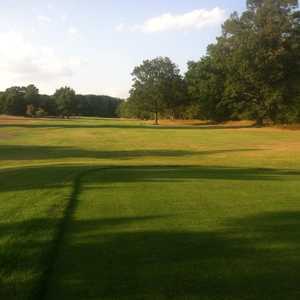 Weiskopf is known for designing great short par-4 holes and the 17th supports that reputation. It measures 302 yards, but can be played a number of ways over waste areas and fescue. Laying-up requires an accurate pitch to a well-bunkered and slippery green. A long drive from the tee, struck with bull's-eye accuracy, could be rewarded with an eagle putt. 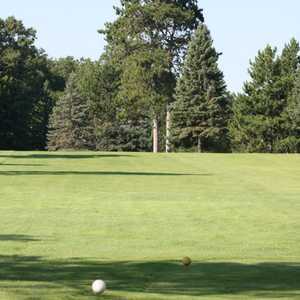 To settle ties or allow for an "aloha press," Forest Dunes has a 117-yard "nineteenth hole." It's a tiny target green, with a bunker in the center, nearly surrounded by Lake AuSable and played to from an elevated tee. Another thoughtful feature of Forest Dunes is the outstanding 15-acre practice facility with short game targets and a two-acre putting course. Especially charming are the junior tees Weiskopf designed into the course rather than as an afterthought. The holes created from the junior tees measure from 411 to 94 yards -- the total length is 5,097. Any other amenities other than pure golf are absent at the moment. Fees are taken in a trailer. The Hanson House Bed and Breakfast in Grayling, an authentic, 1860s Victorian home in pristine condition. Hosts Jill and Dave Wyman welcome guests and provide advice on AuSable and Manistee River canoeing or trout fishing or nearby lakes for swimming and boating, including crystal clear Higgins Lake. Downtown Grayling, with a 1950s soda fountain and other unique shops, is steps away. Phone (517) 348-6630 or e-mail infor@hansonhousebandb.com. If the four guest rooms and full, Grayling has a Holiday Inn, Super 8 and Days Inn with inexpensive, conventional rooms. Shoppenagon's Inn, Downtown Grayling. (989) 348-6071. An old-fashioned dining hall atmosphere inside Chief Shoppenagon's Inn, in the heart of town.